Artist Kesara Ratnavibhushana looks on while Fairway Holdings Group Chairman Hemaka De Alwis lights the oil lamp. 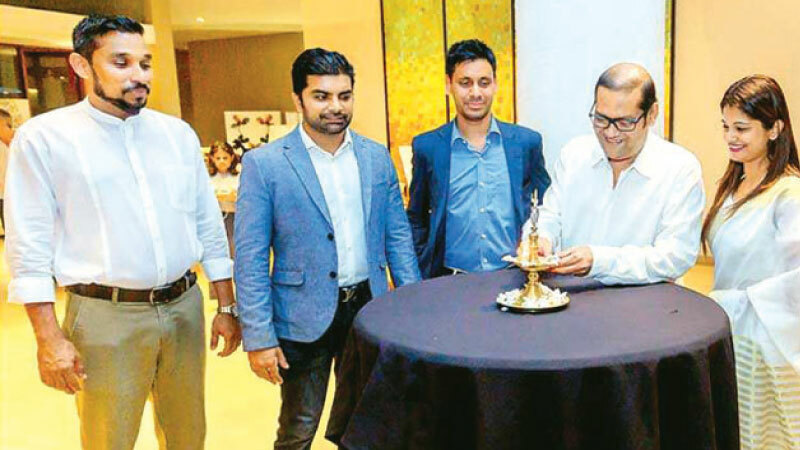 An exclusive showcase of artistic intent was recently conducted on January 18 to 20, 2019, by Artist Kesara Ratnavibhushana, in consultation with Mario Stubbs, Founder, Genesis Global Consultancy and Hospitality Consultant and Le Grand Galle, by Asia Leisure. The event which was given priority to ‘Quintessentially’ members, was in anticipation of an international launch and global strategy. Kesara Ratnavibhushana, is an artist who focuses his work in single-edition, exclusive artwork that transcends art and photography. A professional photographer since 2006, he is considered one of the best in the field in Sri Lanka, with shows locally and in London and the United Kingdom. Kesara has received interest from both local and international art lovers, moreover avid collectors. According to Investec’s Patrick Lawlor, more and more investors are eying the art market (and other collectables) as an alternative to traditional investment assets. According to USA’s Artprice 2017, art auction turnover increased by 5.3% compared with 2016. With China no longer the world’s largest art market (29% of the global market, from 35% in the first half of 2016) by the US – owed to a 28% jump in auction turnover in the US. The UK (up 13%) and France (up 7%) both recorded good gains, the former perhaps benefiting from a weaker pound following the Brexit vote in June 2016. Mario Stubbs, Founder Genesis Global Consultancy, UK and Hospitality Consultant, commented, “Our collaboration toward M Sequence is a strategic one in which we wish to showcase Kesara’s work to the world of high-end art collectors and investors. Having presented the best of artistic expressions since 2005, Kesara Ratnavibhushana has had his exhibitions graced by novel creatives in the expanded industries of art and literature, such as Sir Arthur C Clarke, with his artwork having increased by 160% in one year. Ratnavibhushana has become an innovator and true creator, with collections that offer unique pieces inspired by Botany (Botanica - sold-out with a 70% conversion rate on the opening night) and Architecture (Faction: Sculpture). Asia Leisure’s Le Grand Galle has previously commissioned more than 40 artworks by Ratnavibhushana, representing an artistic partnership that carries over the years.